Clyde the Computer Guy specializes in home PC upgrading, repair, configuring, and training for your optimum PC experience. Using your PC should be an enjoyable experience, however sometimes that's not the case and calling tech support many times can be a hassle. That's where Clyde the Computer Guy comes in…! 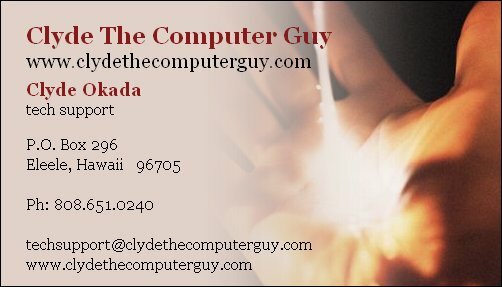 Clyde the Computer Guy is located on Kaua`i and services the entire island, (well most of the island), as well as clients throughout the state of Hawai`i. Note: If it's a tech support question best to contact via email. Payment for services rendered can be done via email through PayPal. A PayPal invoice will be sent to your email address and you will have the option of paying with a credit card or electronic check. This is done fast and securely through PayPal. -Mahalo. **Use this payment option to pay for hourly services rendered, including website maintenance, service calls and any other miscellaneous tech charges (Tips too!). This service is through PayPal.